Smart Medical Reference is a one-stop reference! Lab Values Reference, Drug Guide, Differential Diagnosis, Tests and Procedures Reference, Medical Calculators, PubMed, Spanish Dictionary and Medical Terminology. Quickly find the right information you need when you need it with this beautifully designed, user friendly interface. ■ " I LOVE this app! As a new nurse, it helps me synthesize a solid picture of what is going on with my patients, their multiple disease processes, and my biggest concerns/focuses of their care that day." 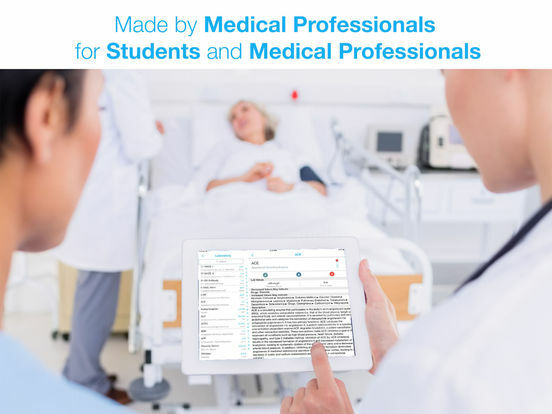 ■ "I always endorse this app to my students and it helped them a lot in their clinicals and greatly improved their understanding and class grades! Thanks for this wonderful app!" ■ Clear, concise coverage of 375 of the most commonly performed laboratory tests. Organized by body systems and lab panels, and presented in a consistent format with normal findings, indications, test explanation, test results and clinical significance. ■ Over 675 “mini” drug monographs that include generic names, trade names, drug classes, pregnancy risk category, controlled substance schedule and we provide to the full FDA monograph through dailymed.nlm.nih.gov. ■ Quickly access indications of commonly ordered diagnostic imaging tests and procedures. ■ Convert lab values from SI to US units. ■ Convert units of measure: Temperature, Mass (Weight), Height, Length, Volume and more. ■ Our English to Spanish medical dictionary translates most common medical words on the fly. ■ Effective, fast, and convenient reference for medical words in both English and Spanish! It is a quick and easy tool to find just the right words you need when communicating with your patients. Words are listed by category with English words and their Spanish translations, and Spanish words and their English translations. It is ideal for every medical or nursing student! ■ Latin and Greek Prefixes, Suffixes, and Root Words are the building blocks of most medical words, understanding these word parts are essential to comprehensive entry-level knowledge of medical language and terminology. We provide you with enough Prefixes, Suffixes, and Root Words in our dictionary to decipher most medical words. 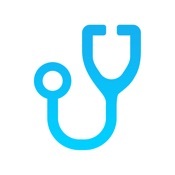 ■ Access over 16,000 medical related abbreviations. ■ Connect to PubMed from within our app to search abstracts and link to publishers websites to view full page articles. Now you can email that great article you found or just save it to Evernote account. ■ Search Medline, DailyMed and Wikipedia from within our app to instantly access the library of medical information contained in these databases via the Web.